I have set up a hostess code for this month's kit. If you would like to participate, place an order using the hostess code XHSVUEEE. Your order must include the Celebrate Today stamp set plus at least $15 of additional merchandise. Orders must be placed by February 15. After that date, I will mail out the supplies and instructions for your 5 cards. Already have Celebrate Today and want to participate? Just use the hostess code and substitute a stamp set of equal or greater value. Check out this week's deals! If you've ever thought about trying our Texture Boutique Machine, now is your time! If you haven't seen the Irresistibly Yours Specialty DSP yet, you are missing out! I will admit, when I saw this in the Sale-a-bration catalog, I was seriously underwhelmed. However, if you take a look at the video Stampin' Up! made to show what you can do with this paper, I think you will suddenly push this item to the top of your wish list like I did! Did you watch the video? Cool, right?!? I ordered some, and I finally took it out the other day to give it a try. I just got the Coastal Cabana Blendabilities, so I decided to use those first, and color the shell design using an ombre color scheme, which is very "in" right now. When I was done, it reminded me of waves, so I decided to pair it with the Sea Street stamp set. The greeting is from the new Celebrate Today stamp set, available in the Occasions Catalog. The paper is so pretty, it really doesn't need a lot of added embellishment! I hope you'll give this paper a try. There are many ways to add color to it, and I can't wait to experiment with it some more! Pretty simple, but fun! If you like either the DSP or the stamp set, make sure to place a $50 order during Sale-a-bration, and you can choose one of them for free! If you purchase by January 31 using hostess code JB9MJ64P, you will also earn entries for my online party giveaway - a package of rhinestones and 2 yards each of Gold and Bermuda Bay Sequin Trim! In case you forgot, Sale-a-bration is going on right now! One of my favorite items, that you can get for FREE!, is the Lotus Blossom stamp set. This is a photopolymer set that creates a beautiful flower, and I've tried out some color combinations to share with you today, as well as a simple card. If you're new to stamping, you could easily order the supplies to make this card and pick Lotus Blossom as your free item when you reach a $50 order. This is called 3-step stamping. You stamp 3 times to get the image of the flower. Stampin' Up! makes it really easy for you by including numbered tabs on the flower images to show you the order in which to stamp. The tabs also help you line up the images (although with completely clear stamps, it really is easy!). There are certainly many more options, and you could also experiment with stamping off the darker color on image 2, or using just one color and stamping off several times. The possibilities are endless! I chose my 3 favorite combinations and created some quick cards. The only other supplies I used, besides the colors listed above, were Wild Wasabi ink, Tuxedo Black Memento ink, and Whisper White cardstock. Super simple, but very pretty. Here are close-ups of the cards. If you are looking for even more inspiration, Stampin' Up! has created a video for this stamp set, showing you exactly what to do, as well as more samples. Don't forget: I have an online party going on all month on Facebook. I'd love for you to join me! Or, simply place an order using hostess code JB9MJ64P for the chance to win a package of Rhinestones, and 2 yards each of Gold and Bermuda Bay Sequin Trim! There is also a new photopolymer stamp set available today. Cute! Well, life has gotten in the way, and I have not finished my next project for you yet. So it goes. I thought I would share one of Stampin' Up! 's videos with you today. 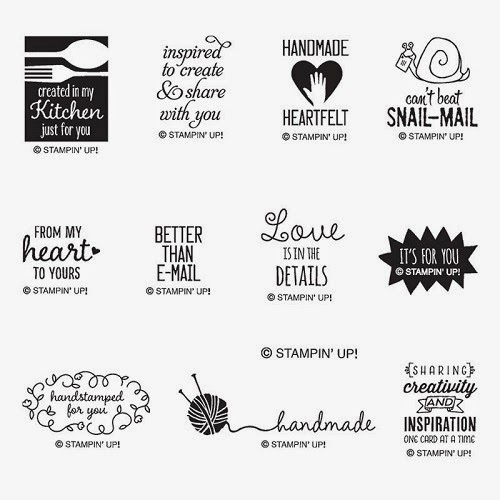 If you have some time, the Stampin' Up! YouTube channel is filled with videos of new products from the Sale-a-bration and Occasions catalogs. If you are having a hard time deciding what to buy, check out some of the videos and see the products in action. I'm going to share the video for The Perpetual Birthday Calendar with you today. This is the project I'm working on right now, so it will give you a little preview. Before I jump in and show you a bunch of new products, I just have to share December's Paper Pumpkin kit with you! I think this was my favorite kit so far! I love when the kits are cards, and this kit had enough supplies for 9 cards (and of course the extras, which are AWESOME this month!). The kit made 3 each of these cards. They're shaker cards! How fun is that?!? I have always been intimidated by shaker cards, so let me tell you a little secret: I had never made one before receiving this kit. It turned out to be really easy, so I think there are more shaker cards in my future. I also loved the color combination this month - Basic Gray, Pistachio Pudding, Bermuda Bay, and Strawberry Slush. For once, I finished making the entire contents of the kit, and I've even used one of the cards already. The stamp set is also really cute. Some might look at these as trash, but I look at it as the supplies for many more cards! Hopefully I'll have time in the next week or so to put a few together to share with you. If you want to see what is in January's kit, make sure to sign up for Paper Pumpkin by January 10. Right now, there is even a sale on the 3-month prepaid subscription. $5 off takes the price down to $54.85, plus you get to pick a free item from the Sale-a-bration catalog! Hopefully I'll be back tomorrow with a new project to share! 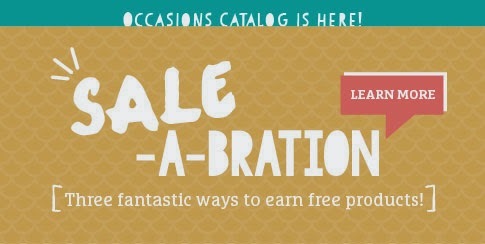 Sale-a-bration and Occasions Catalogs Start Today! This is my second post of the day. Click here to see the first post. The reason for a second post today? The Occasions and Sale-a-bration catalogs start today!!! If you are new to Stampin' Up!, you may not be familiar with Sale-a-bration. Sale-a-bration is our most popular sale of the year, and that's because you have the chance to earn exclusive products for FREE! This year's choices are amazing, and over the next few months, I will be sharing lots of ideas for using them. During Sale-a-bration, you get to pick one of the exclusive products from the Sale-a-bration catalog for free with every $50 you spend. So let's say you spend $150. You get to choose 3 items for free! Awesome! There are also extra perks for hosting a party during Sale-a-bration. If your party reaches at least $250 in sales, you get $25 in extra hostess dollars! 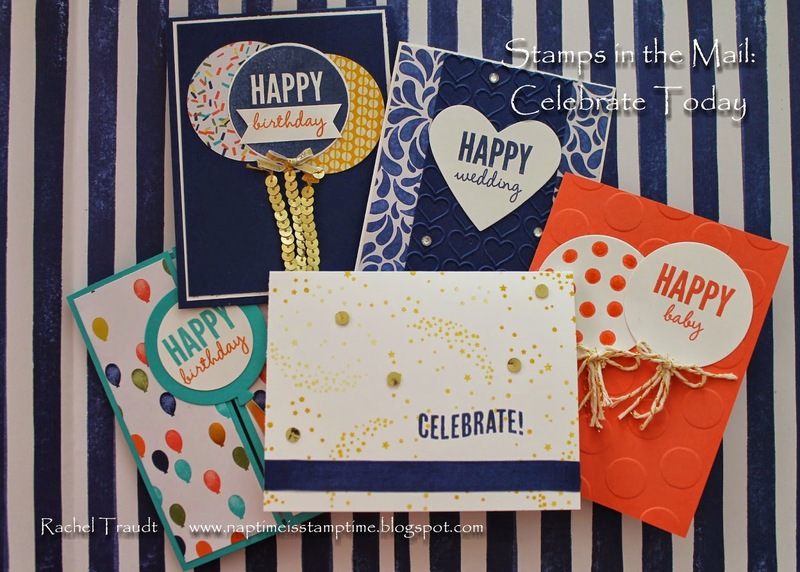 And finally, if you join as a demonstrator during Sale-a-bration, you get to pick either 2 Sale-a-bration items OR one of the kits from the Occasions catalog as a free add-on to your starter kit! Lots of ways to earn free products! Also during Sale-a-bration, there is a special sale on the 3-month prepaid subscription for Paper Pumpkin. If you purchase this subscription, you will get $5 off, bringing your price to $54.85. You get a good deal, AND you qualify to pick a free Sale-a-bration item! Click here to purchase your subscription today. The Occasions catalog sales period runs now through the beginning of June. Sale-a-bration only lasts until March 31, so take a look at the catalog now and plan your purchases so that you can get everything that you want. I am hosting an online Facebook party all month, with chances for a prize. Check it out here. I have lots of posts planned for this month showcasing some of the new products, so make sure to check back often!